Wow! That is a tasty looking sandwich! You guys with cast iron pans can use WW's improvised sandwich press by using Tue bottom of a small pan on top of the sandwich with the big pan underneath. I have tried this and it works! This is a recipe I sort of came up with on my own. It's an amalgam of several gumbo recipes. "gumbo" is an African word, meaning "okra". But this recipe instead uses file' powder to thicken it at the table, rather than okra in the ingredients. Purists will insist that if it doesn't have okra, it isn't gumbo. 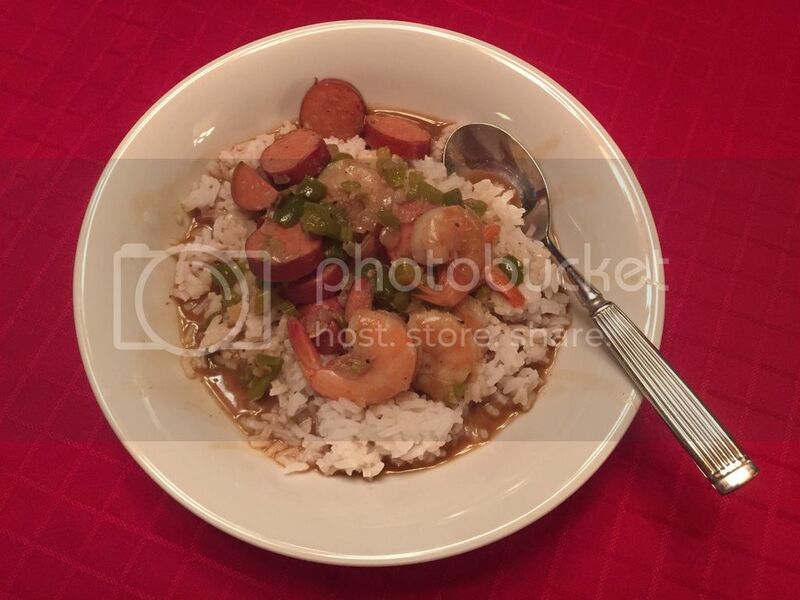 However the French Creoles in the country north of New Orleans made gumbo without okra all the time. Start by chopping your "trinity" of onions, bell pepper and celery, then put them together in a bowl and set them aside, along with the minced garlic. Then in a big cast iron skillet, brown the chicken and sausage well, and set aside. In a big pot, add flour and oil (or bacon grease) and over medium-high heat, keep stirring until the flour turns chocolate brown. This is making a roux. You have to stir constantly or it will burn and you'll need to start over. Any black flecks of burnt flour will ruin the flavor. As soon as the roux gets close to the chocolate brown color, add in the chopped vegetables. This will help prevent the roux from burning. Keep the vegetables moving in the pot just to be safe, for another 30 seconds to a minute. You want them to wilt and glaze a little. They will smell just awesome at this point. After the veggies have wilted some, then you can add 2 cups of chicken stock, and then the chicken and sausage, and the bay leaf. Also add about 2 level teaspoons of the Tony Chachere's creole seasoning, and add about 1/4 teaspoon of black pepper. If you need more liquid, add just enough to barely cover the contents of the pot. You want them all to be wet, but not so much as to thin out the soup too much. Let this simmer on medium-low heat for an hour. After an hour, taste it and add Tony's seasoning until the heat level is to your liking, then add salt until the salt level is to your liking. Before serving, skim off the excess oil from the surface. Oxo makes a great oil separator for the purpose that is a lot easier than trying to scoop it all up with a spoon. Remove and discard the bay leaf. While the gumbo is simmering for an hour, you can start your rice so it will be ready when the gumbo is done. To serve, use wide brimmed soup bowls and place a scoop of white rice in the center of the bowl, then ladle the gumbo around the outside. You can sprinkle about 1/4 to 1/2 teaspoon of file powder onto the gumbo, and a little more on the brim of the bowl and the top of the rice for a garnish. Do the same with a tiny bit of cayenne pepper for color. This is best served with some french bread garlic toast. This same recipe can be modified by eliminating the sausage, and using a lot less chicken stock. The chicken breasts are increased from 2 to 4. Brown them as before and set aside. Make the roux in a deep skillet instead of a pot. When the roux is ready, add the veggies and then just enough chicken stock to keep from burning, then simmer covered over low heat for an hour until the chicken is fully cooked and tender. Taste and season as before. Serve this over rice and you'll have a nice chicken fricassee.! My wife asked me what I wanted for Father's Day dinner, I told her shrimp gumbo. I gave her this recipe and she cooked it up for me. She couldn't find the Gumbo File' seasoning, but it was still mighty tasty. Thanks for the recipe. Looks good! You can also throw in some small oysters and crab meat to really make it nice. A lot of folks put tomatoes in the seafood gumbo. I may have to try this. Love summer sausage, but had no idea how to make it. Add thin sliced turkey or ham, or both! The apple or pear slice adds a neat flavor to the rest of the sandwich, and is a great summertime midday meal with a cold hefe weizen. to the forum, from NEBRASKA! Sounds like a good combo! Thanks for the recipe. If you don't have a panini press, but you do have an old George Foreman grill in one of your kitchen cabinets, they do make a pretty decent substitute for a sammich like this. BTW.....if you get a little time, go to INTRODUCTIONS and tell us a little about yourself and some of your interests. Tried this one from Kephart's "Woodcraft and Camping" and I think, judging by the clean plates, I might have a hit on my hands. After mixing the dry ingredients thoroughly, add cold water, a little at a time, stirring briskly, until a rather thick batter results. Bake like flapjacks. Wholesomer than plain flour flapjacks. These are better with an egg or two added, and if mixed with milk instead of water. I used two eggs and enough milk to get the batter to drop neatly from a spoon, and cooked them in a greased iron skillet until the bubbles set on one side, then flipping them to the other. They eat like a cross between pancakes and cornbread, with the best qualities of each. I've rolled them up with fruit or preserves inside for a quick morning grab-n-go, and have eaten the leftovers broken up in a glass of warm milk. did you use molasses or sugar? They sound good to me as well. Three of them with a sausage link or two (or three) and a couple of eggs over easy and I am a happy camper. I used sugar, but I'm gonna try some local honey with the next batch. This variation of a British-style curry uses unripe bananas to thicken it. Swapping cubed chicken breast, grouse or pheasant for the shrimp and scallops are other versions. Preheat a large shallow pan. Add curry powder and salt and toast lightly. Add oil and garlic. Cook for 2 minutes over a medium heat. Do not brown. Add celery and onion. Cook about 10 minutes to soften the vegetables. Add the vermouth. Reduce by half. Add the chicken broth. Reduce by half. Add the bananas and cream. Continue to cook on medium heat till thickened. The bananas will have softened and melted into the curry. Add the seafood. Cook till the shrimp are pink. Stir in the herbs. Correct the seasoning with fish sauce. Serve hot with steamed Jasmine rice, more fresh herbs*, dried coconut, raisins, raw cashews and Major Grey?s style mango chutney. * Basil, tarragon, chives, cilantro. Note: If meat is substituted for seafood don't leave out the nam pla. It is an all purpose seasoning that adds great depth of flavor to most anything. I did not search for this bread recipe so if it was posted earlier my apologies. 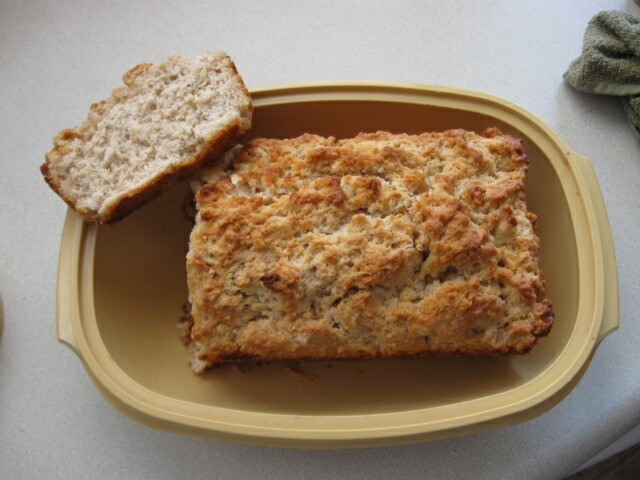 Beer Bread for the lazy. A 12 ounce can of beer. If you get 16 ounce cans drink 4 ounces of it and use what is left. 1/2 cup of sugar (you can use honey or brown sugar if you wish) I use honey most of the time. Mix all the ingredients above. If you use self rising flour delete the baking powder and salt. Put the mix in a bread pan and spread it out to a uniform thickness. Pour the melted butter over the mix letting it drizzle around all the top area. The butter makes a crust on the top. If you don't want a crust mix the butter into the bread dough. Bake for 1 hour at 375 degrees. Put it on a rack and let it cool. I check it at about fifty minutes. i find that it usually can go an hour to an hour and 5 minutes in my oven. This is, a heavy bread, and wonderful as is or toasted lightly with jelly or honey. That sounds like it would be tailor made for a quick bake kettle bread, too. hmmmmm. I might have to break out some cast iron next week.